With the New Year, I wanted to create a healthy lifestyle I could maintain throughout the year. It is important to set yourself up for success with a clear mind and body. With that said, I developed 5 easy ways to create a healthy lifestyle. If you want to live well and live longer, you must exercise! Try to exercise at least 30 minutes a day. Whether it’s going to a gym class on campus or going on a jog at your local park, there are plenty of ways to incorporate exercise in our daily routines. Try walking to class instead of taking the bus, or joining an intramural sport team. Studies show that just 10 minutes of exercise makes a difference—so do something! 2. Be a picky eater! Set yourself up for success! Think about planning a healthy diet as a number of small, manageable steps rather than one big drastic change. Focus on finding foods you love and easy recipes that incorporate a few fresh ingredients. Eat in moderation. Moderation means eating less than we do now. It doesn’t mean you eliminate the things that you love. Just try to eat more healthy things than unhealthy ones. Also think smaller portions. For example, when dining out, choose a starter instead of an entree, split a dish with a friend, and don’t supersize anything. When at home, use smaller plates, think about serving sizes and start small. Eat breakfast! Eating fruits and whole grains in the morning can help jumpstart your metabolism and energy for the day. Avoid eating at night! Try to set a time where don’t eat after. Eating late at during a time when you are less active, can cause weight gain and create unhealthy habits. Studies show that after-dinner snacks tend to be high in fat and calories. So avoid them! Keep a regular sleep schedule. Set a regular bedtime and wake up at the same time every day. Nap to make up for lost sleep, but make sure to be smart about napping. While napping can help you recharge, it can also create bad habits when it comes to your sleep cycles. Lastly, create a relaxing sleep environment. Make your room more sleep friendly. Keep the noise down, keep your room cool, and make sure that your bed is comfortable! The healthiest people are those who have relationships with other healthy people. Healthy relationships reduce stress, unhealthy habits, and help motivate you to succeed and do better. Surround yourself with people who are going to uplift you and make you feel better about yourself. Having a strong foundation is essential to life. 5. Give yourself a break! Find fun activities for you to do to relieve stress! Go to the movies or go shopping. Create new hobbies. Hang out with your friends. Do anything that makes you feel happy. It’s important for you to take a break from life’s stresses and create awesome memories. At the top of every New Year, there seems to be a fitness trend that propagates through families, colleges, and churches, alike. The notion that this year is the perfect time to get into the best shape of your life is evident on social networks, such as Facebook and Twitter. Hash tags like #teamGetFit, #trainHard, and #bodyProud are a select few that are seen everywhere and even appended to statuses and tweets posted around the world. A lot of the time, the motivation behind this burst in healthy behavior corresponds with New Year's resolutions or the mere fact that some over indulged during the Thanksgiving and Christmas holidays! However, as the months past by and the year gets old, fitness clubs and sport gyms see a constant decline in membership and weekly attendance. Whatever the reason may be, I set out to find if this year was any different than in year's past. In comes CES 2013, the Consumer Electronics Trade Show where the biggest tech news is announced for those of us who have a deep affinity for smart devices and innovative gadgets. Originally seen as the place where power hitters, such as Apple, Microsoft, Samsung, and Amazon, have unveiled new products, its recently transformed into the "IT" place where the little guys bring us the most joy. Welcome to the future, where your body is technology's new frontier. The mobile applications and computing power we've become accustomed to in our smartphones are starting to migrate into wearable devices. Whether it is the Nike+ Fuelband from our favorite sneaker brand, fitbit, the same company that added style to Bluetooth earpieces or the Fitbit Ultra by an upcoming start-up company focusing on health and fitness devices; the ability to upload and analyze your personal training sessions can now be done on the fly without the need of paper and pencil. 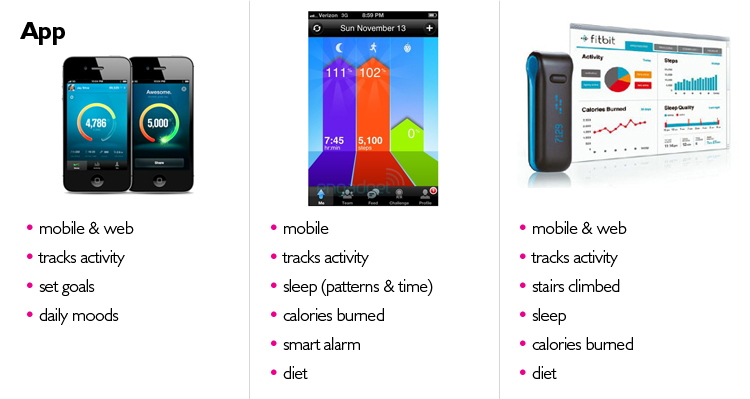 Figures 1 and 2 show a quick glance of each company's wearable devices and corresponding mobile applications. POLL: Does being able to track your fitness activity and sleep patterns, interest those committed to fulfilling their New Year's resolution?  Does mobile health “fit” into your commitment to your personal health and wellbeing?